Ah PVP. To many it is a time-honored tradition pitting foe against foe in a match to the death. In others it is nothing but an epeen blaster for the bully in all of us. So what is PVP? Is it a timed match where evenly numbered opponents battle in a small map over capturable nodes, or is it something more? To this writer PVP is many things. PVP is persistent. PVP is massive. PVP is tactical and lastly PVP is dynamic. I cut my teeth in a small game called Dark Age of Camelot. I started playing before the original definition for Battlegrounds was implemented. Instead of calling PVP, um PVP it was called RVR or Realm versus Realm. So yes there is a difference between a “player vs. player” concept of 1 to 1 combat and a “realm vs. realm” mentality. Just the words mean something different. So how does this all tie into what we will see in Star Wars: The Old Republic and how will we hopefully see this used in the open world content we will see. Yes that is right I will be talking about the open world content in this piece because I feel plenty has been offered for the warzones. 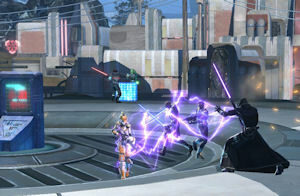 In June of 2010, myself and another SWTOR forum attendee called Raul wrote a lengthy piece, and it was a biggie, on what we would like to see the open world of PVP in SWTOR to look like. We went in to huge detail on maps, concepts and objective, here is the link if you want to read it. It is really good I think. Since then we have learned that Illum or lvl 50 end game planet and Tatooine which run the gambit of low to mid 20’s will offer those of us who love this style of game play a fix. Illum has objectives. It has strategy and it is persistent. Each side is trying to dominate the other for the reward of mining force crystals. We need to take over the others base in both a mix of player vs. play and player vs. Environment activities. We will have rocket launchers to blow up certain objectives and in the end become king of the hill, or until the other side can do the same to us. I am hoping we will see this become more fleshed out as time goes on. Don’t get me wrong this is a good start for those of us who love open world PVP but like to PVP when we want to. Most of us are just happy BioWare gave this to us, I know I am. There will be zergs but there will also be coordinated groups and alliances communicating to each other and to the faction on movements and tactics to overcome our foe. Remember open world is NOT a solo persons game, it is a TEAM game. Best you can hope for if you are running solo is that you can melt into a group and tap their kills and gain valor. But that will not be as effective as a team can take down a foe very quickly and efficiently. Also a coordinated team can on occasion take down a superior numbered foe that might be less coordinated or a zerg. I will now briefly touch on Tatooine. From what I have read the Den of Thieves open world area on Tatooine will be a free for all, everyone against everyone else, no faction based area. Teams will be on the same side but against the rest of the populace in the area. I have not tried this area yet and am not sure I will be a major fan because I tend to be more of a faction vs. faction player and not a free for all player like we see in PVP only games like Shadowbane of the old days. So as you can see TOR open world PVP should give us tactics, persistence, group play and no timers in an area that is defined. It is a good end game start for us who love this game play and I know I hope we see more of this type of content patched in post launch. Nice write up was a good read. Great write up. But whats with all the drug links on your homepage? Must be a hacker attack. It’s gone now. We are looking for the leak and trying to fix it!